Thank you for supporting City Lights. Make a Contribution via PayPal below. Celebrate our 15th Anniversary on April 12, 2019. 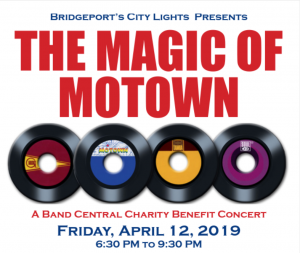 Party with Band Central performing the Magic of Motown Revue at the Downtown Cabaret Theatre and City Lights Gallery at 265 Golden Hill St., Downtown Bridgeport CT 06604 203.334.7748. THANK YOU! to Band Central, the lead sponsor of this charity concert.